What Is Softshell Clothing And Why So Popular? The term Softshell is a class of woven materials used in creating garments that provide a combination of water- and wind-resistance and breathability. Softshell clothing is warm, water-resistant, durable and flexible, but it’s the addition of fashion-forward designs and comfort-enhancing features that make it so popular. Instead of the bulky and heavy jackets that people get tired of wearing, softshell jackets offer a streamlined fit and very smooth exterior that is almost soft to the touch. 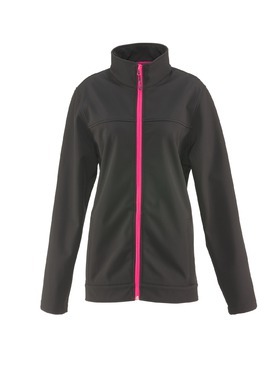 The RefrigiWear Softshell line consists of stylish jackets, vests and overalls with color options and trendy accents. What Are The Softshell Benefits? Softshell clothing is one of latest trends in the cold weather clothing industry, getting its start with sports like golf and sailing. For cold weather and cold environments, the fact that we can make it fashionable and functional make softshell one of our most demanded types of winter jackets. As a material, softshells are more stretchy and less bulky, meaning you get a higher level of flexibility than in other jackets, like those lined with down or packed with synthetics. It is water-resistant (sometimes water-proof), exceptionally durable and very breathable, all key features for a hard-working jacket. Softshell materials also make it possible to create a more form fitting jacket since the outershell adds to the total insulation of the garment without adding the bulk of more internal insulation. Softshell clothing is great for aerobic activities where a highly breathable, water-resistant piece of clothing can keep the wearer warm, dry and active. The softshell material allows perspiration to evaporate and keeps you dry, so sweat doesn’t affect your warmth. It is especially good for activities where your heart rate will be elevated — hiking, cycling and other outdoor sports. 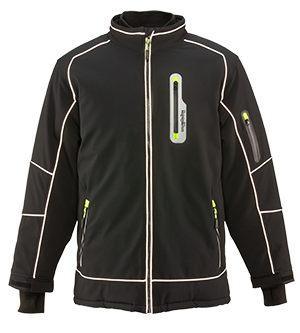 What Makes RefrigiWear Softshell Clothing Different From Others?
. In fact, our softshell clothing offers a range of jackets, vests and bibs comfort rated from -60°F with our Extreme Softshell to 30°F with our standard softshell jackets. RefrigiWear is an expert in cold, but also in functionality and comfort. That's why we add fleece-lined pockets, reflective accents, waterproof pockets and many other features to softshell products—to make sure you feel warm, look good and have all you need at your fingertips.